The truth is that the hybrid finds himself alive and human, with all that this signifies in terms of capacity for soul development. The pure-bred has no better initial equipment. In the matter of human fundamentals they come to differ only as a different nurture plays upon a very similar human nature. There surely are no real data for the support of Le Bon's notion that contrary heredities sap the vitality of hybrids and leave them barren of soul. Harvey Ernest Jordan, "The Biological Status and Social Worth of the Mulatto," The Popular Science Monthly, (June 1913): 573-582. 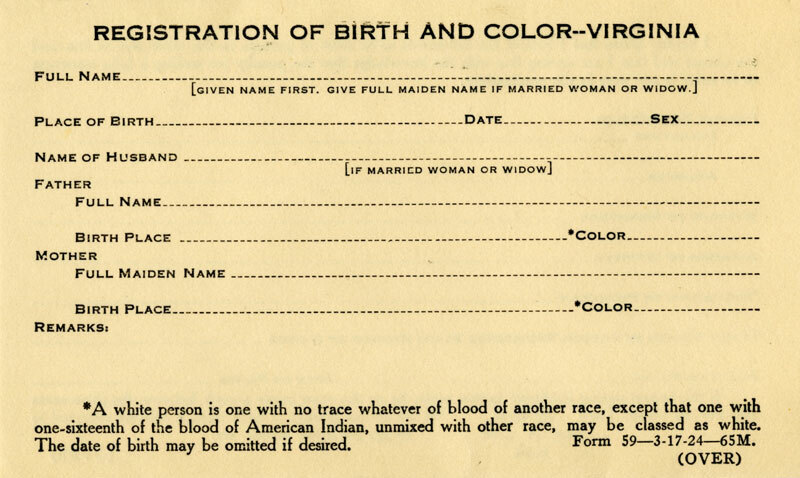 The Racial Integrity Act of 1924 of Virginia, United States, was a law that had required the racial makeup of persons to be recorded at birth, and prevented marriage between “white persons” and non-white persons. The law was the most famous ban on miscegenation in the United States, and was overturned by the United States Supreme Court in 1967, in Loving v. Virginia. …4. No marriage license shall be granted until the clerk or deputy clerk has reasonable assurance that the statements as to color of both man and woman are correct. If there is reasonable cause to disbelieve that applicants are of pure white race, when that fact is stated, the clerk or deputy clerk shall withhold the granting of the license until satisfactory proof is produced that both applicants are “white persons” as provided for in this act. To read the complete text, click here. 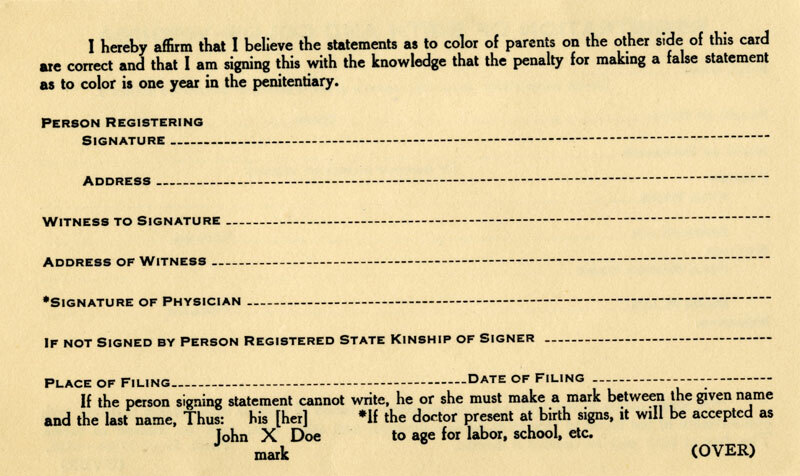 Registration of Birth and Color, 1924. Rockbridge County (Va.) Clerk’s Correspondence [Walter A. Plecker to A. T. Shields], 1912–1943. Local Government Records Collection, Rockbridge County Court Records. Library of Virginia, Richmond, Virginia. This entry was posted	on Saturday, August 6th, 2011 at 04:44Z	and is filed under Definitions, Law, Media Archive, United States, Virginia. You can follow any responses to this entry through the RSS 2.0 feed. Both comments and pings are currently closed.